Author contributions: Egorov VI made principal conceptual contributions and designed the case report; Egorov VI, Kharazov AF and Petrov RV made contributions to primary surgery; Starostina NS and Kondratiev EV performed radiology imaging and reporting; Filippova EM and Pavlovskaya AI carried out the pathology investigations and reports; all authors contributed to data acquisition and interpretation, literature research, drafting the manuscript, revision and final version approval. Pancreatic neuroendocrine tumors (PNTs) are relatively uncommon although these neoplasms have been noted to grow in occurrence in recent decades. Surgical removal of locally advanced PNTs involving major vessels and adjacent organs is warranted by reason of an appreciably more favorable prognosis as compared to exocrine pancreas cancer. We are reporting a case of successful multi-organ resection combined with a wide excision of the superior mesenteric, common, proper, left and right hepatic arteries (in the presence of the hepatomesenteric trunk variant of aberrant arterial anatomy) for multifocal PNTs in the setting of multiple neuroendocrine neoplasia type 1 syndrome. The procedure resulted in pain abolition, a significant improvement in the patient’s life quality and allowed her to return to work. Follow-up computed tomography at 15 mo post-surgery showed no evidence of disease recurrence. Pancreatic neuroendocrine tumors (PNTs) are rare gastrointestinal growths having an incidence of 1.8-2.6/100 000[1-6] though autopsy reveals them with 1000-10 000 times that frequency. These neoplasms are classified as functioning and non-functioning according to the type of hormones they release and their activity. PNTs are non-functioning in 47%-90% of cases[1-8] and it is on account of hormone hypersecretion that patients with modest-sized functioning tumors are routinely identified. Because of their non-specific symptoms non-functioning PNTs are discovered much later and may attain quite a large size with invasion of neighboring organs and vascular structures and/or development of distant visceral metastases by the time of diagnosis. PNTs may be sporadic (presenting an independent condition) as well as found in the context of multiple neuroendocrine neoplasia type 1 (MEN-1 syndrome). The latter classically comprises the triad of PNT(s), hyperparathyroidism, in the presence of background hyperplasia or parathyroid adenoma, and pituitary tumor (most commonly - prolactinoma). Classification by the tumor-node-metastasis staging system, the newest edition of the World Health Organization tumor classification scheme, mitotic index and Ki-67 proliferation index enable a general prognosis for the behavior of PNT but because of the unpredictable nature of the disease they are by no means universal contributors to decision-making in each individual case. Resection with achieving tumor-free resection margins provides improved survival rates and remains the best treatment option[3,5,6,8]. Combined multi-organ R0 and R1 resections for locally invasive neuroendocrine cancer are justified as long as there is careful patient selection and avoidance of a R2 resection[8,10]. Critical selection of candidates for the procedure is dictated by both its being technically most demanding and the patient‘s ability not only to bear the operation but also to come through potential complications after it. Abundant evidence in favor of the aggressive approach notwithstanding[3,5,6,8], so far, there have been no prospective (or) multicenter studies addressing survival rates and quality of life in that group of patients with PNTs, which is quite frequently a handicap to deciding on the policy of treatment. We are reporting a case of multiple PNTs (as part of MEN-1 syndrome), spreading to the main arteries, and the outcome of surgical treatment demonstrating the feasibility and benefit of such an aggressive intervention. A 33-year-old woman entered Vishnevsky Institute of Surgery on the 8th April, 2011, being admitted to the Department of Hepatopancreatobiliary Surgery with presenting complaints of frequent upper abdominal pain attacks, accompanied by vomiting, and discomfort. A neoplasm of the pancreatic head was detected on ultrasound. Computed tomography (CT) showed the area of the pancreatic head and uncinate process to be replaced by a low-density mass strongly enhancing in the arterial phase and measuring 51 mm × 60 mm × 65 mm (Figure 1). There was obvious embedment of the common hepatic and superior mesenteric arteries in the growth. The upper contour of the tumor was seen to immediately abut the portal and superior mesenteric veins. The pancreatic body and tail were found to harbor similarly appearing entities of 18 mm and 12 mm. The variant arterial anatomy was delineated with the common hepatic artery (CHA) stemming from the superior mesenteric artery (SMA) and penetrating the pancreatic parenchyma (the hepatomesenteric trunk with the CHA having a transpancreatic course) (Figures 2 and 3). Two right adrenal space-occupying lesions with diameters of 32 mm and 22 mm were visualized with attenuation values near identical to those of the pancreatic masses (Figure 3A). 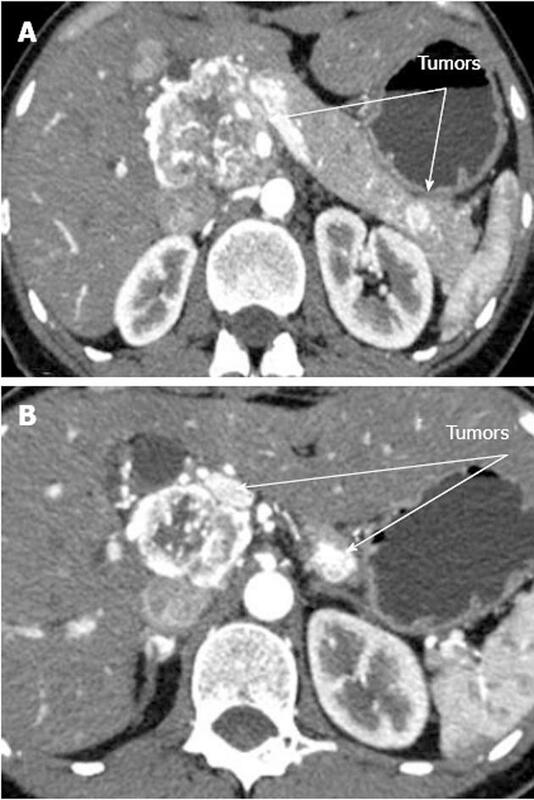 Abdominal magnetic resonance imaging (MRI) using Gadovist® identified tumors of the pancreatic head, body and tail and a right adrenal mass of similar sizes to those shown on CT. Neither CT nor MRI detected any distant metastases to the liver, peritoneal cavity or retroperitoneal space. Figure 1 Computed tomography arterial phase. А: Hypervascular tumors of pancreatic head and tail; В: Hypervascular tumors of pancreatic head and body. Figure 2 Computed tomography arterial phase. А: Axial view. Common hepatic artery (CHA) passing through pancreatic parenchyma affected by tumor; В: Coronal view. Hepatomesenteric trunk dividing into superior mesenteric artery and CHA. CHA running within pancreatic tissue (transpancreatic course). SMA: Superior mesenteric artery; PNT: Pancreatic neuroendocrine tumor. 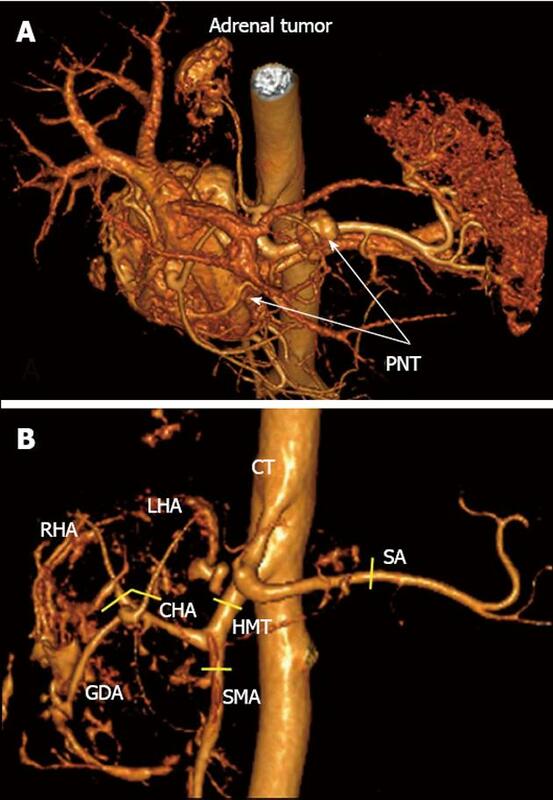 Figure 3 Three-dimensional computed tomography angiography after omission of renal artery image. 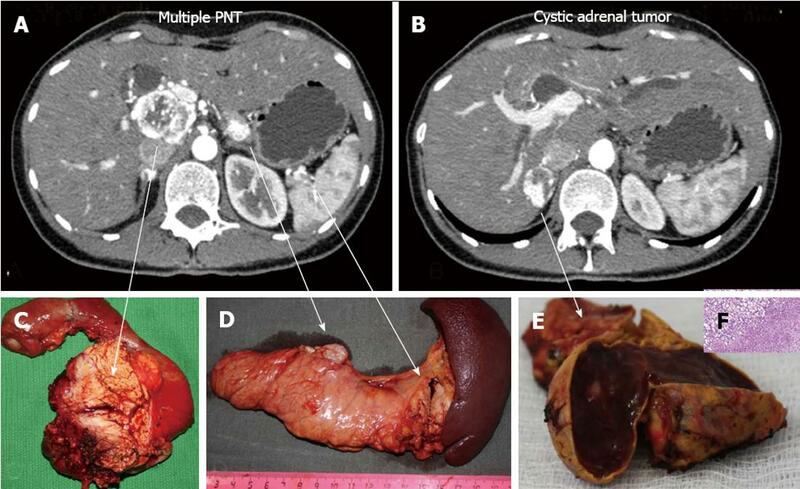 А: Hypervascular tumors of pancreatic head and body [pancreatic neuroendocrine tumors (PNTs)], hypervascular right adrenal tumor (tail tumor not shown), right adrenal artery originating from celiac trunk (CT); B: Celiaco-mesenterial arterial architecture found, common hepatic artery and superior mesenteric artery arising from hepatomesenteric trunk (Michels, type IX). GDA: Gastroduodenal artery; LHA: Left hepatic artery; RHA: Right hepatic artery; SMA: Superior mesenteric artery; CHA: Common hepatic artery; SA: Splenic artery; HMT: Hepato mesenteric trunk. Yellow segments indicate lines of arterial resections. 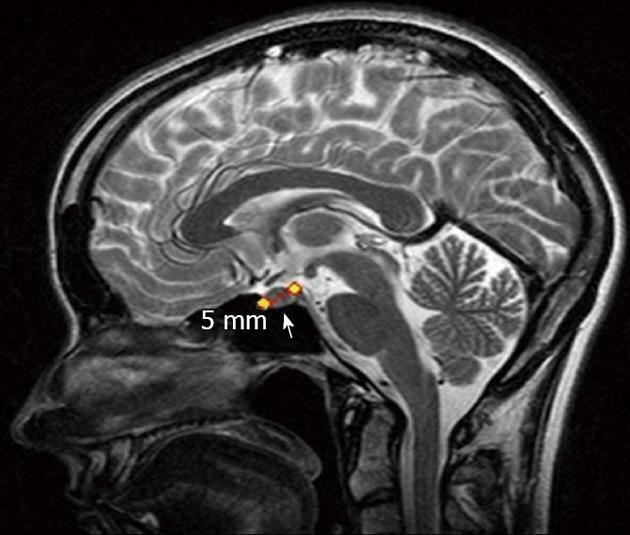 Brain magnetic resonance imaging revealed a right anterior pituitary tumor up to 5 mm across (Figure 4). The adrenocorticotropic hormone, cortisol, metanephrine and prolactin concentrations were not elevated. The chromogranin A and carbohydrate antigen 19-9 levels, total bilirubin and ionized calcium were 23.0 U/L (norm < 17.2 U/L) and 35.42 U/mL (norm < 37 U/mL), 31.84 μmol/L (norm - 3.4-20.5 μmol/L) and 1.25 mmol/L (norm - 1.15-1.29 mmol/L), respectively. Figure 4 Magnetic resonance imaging. Pituitary adenoma (arrow). Stage T4NxM0 multiple neuroendocrine pancreatic head, body and tail (with involvement of the superior mesenteric and common hepatic arteries) and right adrenal tumors, left adrenal hyperplasia, pituitary microadenoma, and MEN-1 syndrome. None of the three fine-needle aspiration biopsies retrieved was of any informative value. Core-needle biopsy was deemed ill-advised in view of its potentially carrying a high risk of bleeding from the hypervascular tumor. Considering the neuroendocrine nature of the neoplasms and violent pain syndrome, after institutional consultative opinions having been obtained, an attempt at curative surgery as extensive as pancreatoduodenectomy in combination with superior mesenteric and hepatic arteries resection and repair and right adrenalectomy was opted for. 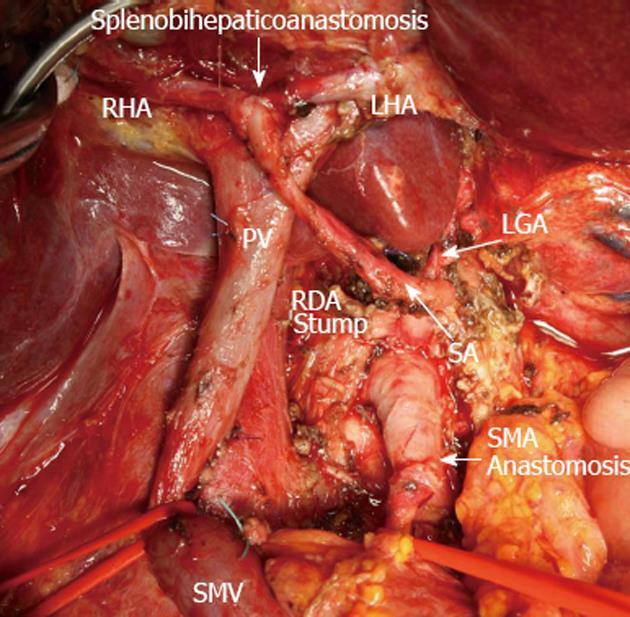 On the 12th May, 2011 the patient was operated on and total duodenopancreatectomy combined with SMA resection and formation of an end-to-end anastomosis, excision of the common and proper hepatic artery, including its division into the right and left hepatic arteries, reconstruction of the bifurcation into the right and left hepatic arteries with creation of an arterial splenobihapatic anastomosis, splenectomy and right adrenalectomy were performed (Figures 5 and 6). Figure 5 Schematic sketch of procedure with omission of right adrenal tumor. А: Before surgery. Tumors of pancreatic head, body and tail (pancreatic neuroendocrine tumors, PNTs). 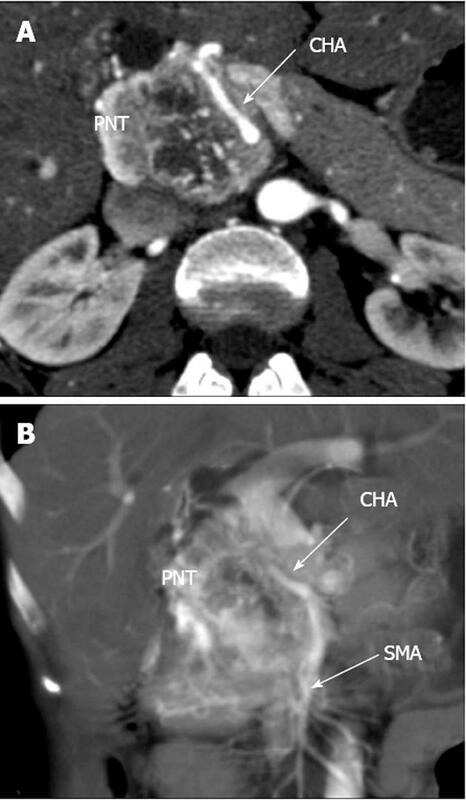 Pancreatic head tumor involving site of hepatomesenteric trunk division into superior mesenteric artery (SMA) and common hepatic artery (CHA) together with all of CHA, proper hepatic artery (PHA), gastroduodenal artery (GDA) (omitted) and right and left hepatic arteries (RHA and LHA) bifurcation; B: After total duodenopancreatectomy, splenectomy with SMA, LHA and RHA resection, excision of CHA and PHA and right adrenalectomy. SMA is sutured to the root of resected hepatomesenteric trunk. Splenic artery (SA) resected, U-turned and sutured to newly reconstructed LHA and RHA union. LGA: Left gastric artery; PV: Portal vein; SMV: Superior mesenteric vein. 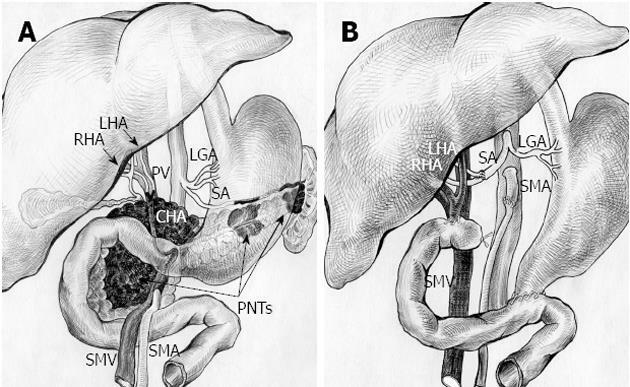 Figure 6 View of operating field after total duodenopancreatectomy and splenectomy with superior mesenteric artery, left hepatic artery and right hepatic resection, excision of common hepatic artery and proper hepatic artery and completion of vascular reconstruction prior to right adrenalectomy. Superior mesenteric artery (SMA) sutured to the root of resected hepatomesenteric trunk (SMA anastomosis). Splenic artery (SA) resected, U-turned and sutured to newly remade left hepatic artery (LHA) and right hepatic (RHA) junction (splenobihepaticoanastomosis). LGA: Left gastric artery; SMV: Superior mesenteric vein; PV: Portal vein; RDA: Right (inferior) diaphragmatic artery. The approach was via a T-shaped incision. There were no metastases discovered at exploration. The area of the pancreatic head appeared as a solid knobby mass up to 7 cm in diameter. The pancreatic body contained a solid intraparenchymal entity up to 2 cm across, at approximately 5-6 cm from the neck, and there was a mass of diameter up to 1.5 cm in the pancreatic tail. The right adrenal was enlarged due to the presence of a 3.5-4 cm diameter tumor. After duodenal mobilization by a Kocher maneuver the neoplasm was found to be intimately adherent to the celiac trunk and portal vein. 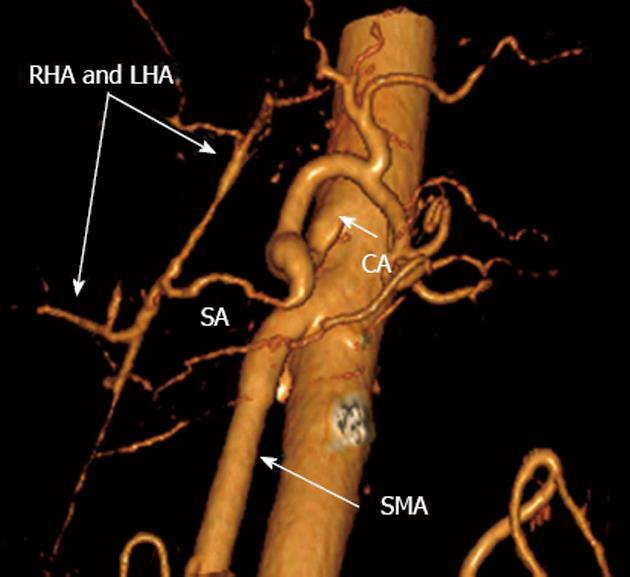 The SMA, for 2.5 cm at the site of the CHA origin, the common and proper hepatic artery together with its branching into the right and left hepatic arteries were affected by the tumor. The SMA was tumor free over a run of the initial 2.5 cm. There was no evidence of tumor involvement of the portal, superior mesenteric veins or their confluence with the splenic vein (Figure 5). We were faced with some technical troubles while removing the pancreaticoduodenal complex in combination with excision of a 2.5-cm length of the SMA, common and proper hepatic artery along with the latter’s bifurcation into the right and left hepatic arteries. An end-to-end anastomosis of the SMA was applied. The SMA clamping time was 32 min. The junction of the right and left hepatic arteries was refashioned by suturing. The anticipatory evaluation of the parenchyma to be left intact subsequent to the intended resection of the pancreatic body and tail prompted us to choose total pylorus-preserving duodenopancreatectomy. At that stage of the procedure the splenic artery with no macroscopically apparent tumor ingrowth was mobilized up to the mid-pancreas, transected and sutured into the remade fork of the hepatic arteries. The clamping time of the hepatic arteries with the portal circulation maintained was 90 min. The pancreatoduodenectomy was completed with en-bloc resection of the spleen, pancreatic body and tail, adjacent lymph nodes and tissues along the perimeters of the celiac trunk, its branches (Groups 9 and 11) and the hepatoduodenal ligament structures (Groups 8 and 12). The retropancreatic nodes were removed together with the fusion fascia (Group 13). The SMA was skeletonized up to the level of the third jejunal artery origin (Group 14). Mobilization of the liver, exposure of the right adrenal and right adrenalectomy were done. One-loop reconstruction of the gastro-intestinal tract was accomplished: a hapaticojejunal anastomosis posterior to the colon in tandem with a duodenojejunal anastomosis anterior to the colon were made one after the other (Figure 6). The pancreatic head lesion exhibited a mixed morphological pattern composed of areas with marked nuclear and cellular atypia and regions having a solid alveolar small cell appearance. There were necroses in the tumor and evidence of perineural extension. The pancreatic body and tail entities displayed an organoid arrangement of rather monotonous cells. The malignant cells of the neoplasms expressed synaptophysin, chromogranin A and cytokeratin-19 with proliferation indices of 40%, 3% and 3% correspondingly (Figures 7-9). Figure 7 Histopathology: pancreatic tumors (C, D) and right adrenal cystic tumor (E, F) fully compatible with their computed tomography-predicted locations (A, B). F: Microscopy; HE stain × 200. Right adrenocortical clear cell adenoma. 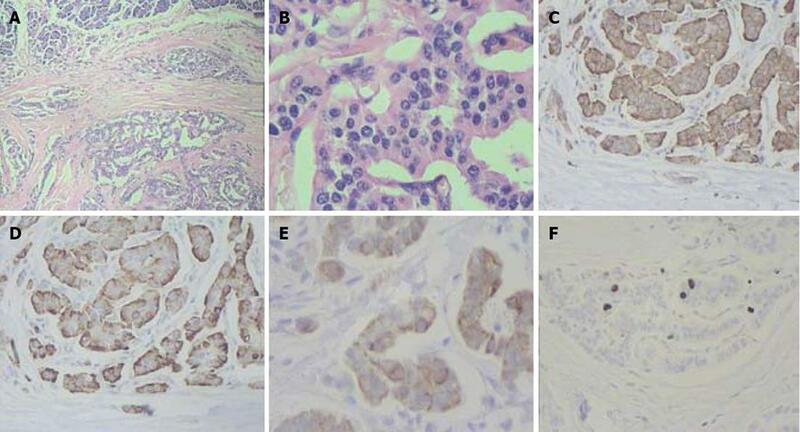 Figure 8 Histopathogical features and immunohistochemical characteristics of pancreatic head neuroendocrine carcinoma. A: Predominantly solid type of tumor cell growth, HE stain, × 75; B: Comedo-type structure with necrotic focus, HE stain, × 150; C: Strong synaptophysin expression in tumor cells, × 200; D: Strong diffuse chromogranin A expression in tumor cells, × 200; E: Cytokeratin 19 expression in tumor cells, × 200; F: A Ki-67 proliferative index of 40% by immunohistochemistry, × 200. Figure 9 Histlopathological and immunohistochemical patterns of pancreatic body and tail neuroendocrine tumors. A: Organoid appearance of tumor cell growth, HE stain, × 75; B: Typical trabecular architecture formed by homogenous small cells, HE stain, × 400; C: Synaptophysin expression in tumor cells, × 200; D: Tumor cells positive for chromogranin A, × 200; E: Tumor cells positive for cytokeratin 19, × 200; F: A Ki-67 proliferative index of 3% by immunohistochemistry, × 200. The pancreatic head tumor had a mosaic-like histological appearance which was featured by areas of low Ki-67 being interspersed with those of high Ki-67 (from 2% to 40%) and chromogranin A expression varying from faint to strong (from 0 to 3+). 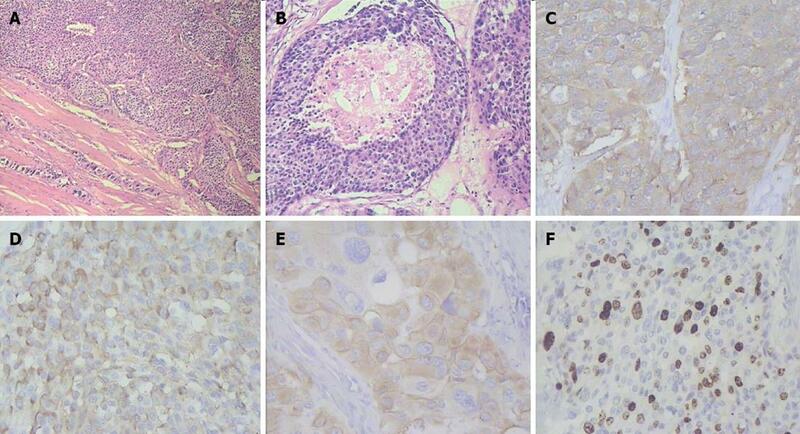 Discordant Ki-67 (from 2% to 40%) and chromogranin A (from 0 to 3+) quantitative results were obtained in different areas of the pancreatic head neoplasm and the highest values were taken as those characteristic of the tumor. Neuroendocrine carcinoma of the pancreatic head [pancreatic neuroendocrine carcinomas (NECs), Grade 3], neuroendocrine tumors of the pancreatic body and tail (PNT, Grade 2), pT4NoMo, adrenocortical clear cell adenoma, pituitary microadenoma, MEN-1 syndrome. The patient had transient (type A) delayed gastric emptying and was discharged after her insulin dosage had been tailored. There is no evidence of disease recurrence at 15 mo follow-up. The vascular anastomoses have been quite functional (Figure 10). The lymph nodes showed no evidence of malignant growth. The patient was started on long-octreotide 6 mo following the operation. With a daily insulin dose of 35 U for specific surgery-related diabetes mellitus and 280 000 U of pancreatin (Creon®), the patient has been working and driving a car. Figure 10 Three-dimensional computed tomography angiograpy (after renal artery image removal) 15 mo post-surgery. Patent nonstenotic superior mesenteric artery (SMA) and arterial splenobihepaticoanastomosis providing ample adequate blood supply to liver. SА: Splenic; LHA: Left hepatic; RHA: Right hepatic; CA: Celiac artery. A successful multivascular resection with reconstruction of the major parapancreatic arteries so extensively performed to assist total duodenopancreatectomy has not been described before. That is not only attributable to non-functioning PNTs being so exceptionally seldom encountered[2-9], the absence of distant metastases at the time of such a sizable G3 tumor diagnosis[3,5,11-18] and reluctance to resort to challenging surgical aggression for locally advanced tumors, but is also due to the rarity of the above-described celiaco-mesenteric arterial anatomy. The CHA arising from the SMA is a remarkably unusual occurrence per se (hepato mesenteric trunk, Michels type 9), reported by Michels in 4.5 % (18) and by others in 2.1%-8% of cases[20-37]. The aberrant arterial anatomy observed in the case under discussion is many times so much so extraordinary owing to the exquisiteness of the CHA having a transpancreatic course[38,39]. It was precisely these considerations that accounted for and required resection of such a substantial stretch of the arterial vasculature. Review of the literature suggests the advantages of surgical management of locally advanced pancreatic neuroendocrine cancer[40-43]. However, the dissimilarities between the analyzed groups (different stages of the disease, mixed functioning and non-functioning PNTs) and diversity of multi-modality adjuvant therapies preclude this inference from being completely valid, that is to say, the prolonged survival including adequate life quality and acceptable mortality and morbidity rates for these patients has yet to be demonstrated. There can still be only scant foreknowledge of the evolution of PNTs in spite of the development, adoption and perpetual updating of tumor staging and histopathologic evaluation systems and classification schemes. Although in most instances conventional markers do correlate with prognosis, tumor heterogeneity of pancreatic NECs invites further investigation into their biology. Poorly differentiated and disseminated NECs carry a dismal prognosis[8,45]. Therefore preoperative diagnostic work-up and assessment of the extent of tumor spread are of critical importance. Radionuclide procedures such as somatostatin receptor scintigraphy (with 111In-octreotide), 68Ga-DOTATOC positron emission tomography (PET), 111In-DTPAOC single photon emission computed tomography and F-DOPA PET are essential facets in extension determination of neuroendocrine neoplasm and NEC (including extrahepatic spread) and detection of somatostatin receptors. We had no way of using these reagents from the fact that none of them had been registered in Russia by the time of the patient’s presentation. Just then the somatostatin analogue manufactured in Russia (111In-octreotide) was undergoing clinical trials and was likewise unavailable for use. Taking into account the above state of affairs we reasoned that the CT and hepatocyte-specific contrast-enhanced MRI evidence obtained would suffice to evaluate the extent of tumor involvement. We believe it is wise that surgery in patients with locally advanced poorly differentiated NEC should unfailingly be preceded by neoadjuvant therapy. However, in this instance we were unsuccessful in our attempts to collect enough material by fine-needle aspiration to reliably judge the degree of tumor differentiation. It is still not clear why, despite the enormousness of the poorly differentiated NEC and so high a proliferative index in a patient with MEN-1 syndrome, there were no metastases detected both prior and a year after the surgery. The latest recommendations made by the European Neuroendocrine Tumor Society espouse an aggressive surgical approach to locally advanced PNTs with mandatory high patient selection, no circumferential encasement of the SMA and the superior mesenteric vein and PV being out of circumferential tumor contact in the absence of portal cavernoma. The clinical description of the case under review was only partially consistent with these recommendations, and yet skipping neoadjuvant therapy in favor of upfront surgery was motivated by the totality of a number of reasons: constant rather refractory pain syndrome, inability to eat normally because of frequent vomiting , progressive rapid weight loss, young age, hugeness of the tumor, invaded arteries and absence of distant metastases were the rationale behind the patient’s having no alternative treatment option but to undergo surgical therapy. The above case shows combined duodenopancreatectomy with multiarterial resection to be safe enough when carried out in such a step-by-step order as to prevent prolonged bowel and liver ischemia, after thorough preoperative planning, with the surgeon’s experience and skill in extended pancreatectomy. Choosing the strategy of treatment for locally advanced PNTs is most difficult every time and the realistic assessment of operability and resectability still presents a challenge even to an expert. As regards deciding on the policy of treatment, the preoperative determination of the degree of tumor differentiation is crucial in choosing between heroic surgery and a neoadjuvant approach, although even with this clue in hand, opting for either of them still poses a dilemma. Besides the tumor biology and technical feasibility of the procedure, the patient’s ability to come through and the surgeon’s capability to deal with foreseeable postoperative sequelae, postsurgical life quality as well as potential benefits from available alternative therapies and previous experience with extended pancreatectomy and vascular resection as its part must be taken into consideration[8,37,42,46,47]. The authors would like to express appreciation to Ingrid Evaldovna Valeniks for her translation, Vadim Victorovich Maslennikov for his drawings and to Miratorg® company for the financial support for this publication.